Before doing a reading, make sure you've brushed up on the Basics of Tarot and Preparing for a Reading. Now that you've laid down your Tarot cards, in the spread of your choice, this is where the real fun begins. If someone has come to you as a Querent, it's because they want to know what's going on -- what sorts of things will present obstacles to them, what positive outcomes they can expect, that sort of thing. But they also want it to be interesting. After all, anyone can flip open a book and read that the Ten of Cups means contentment and happiness. What they really want to know is how does it apply to them? Try to tell a story about what you say. Instead of saying, "First you have a Ten of Cups, and that means love and happiness, and then you have a Queen of Wands, which means someone who is fruitful, and the Empress means fertility and wealth, blah blah blah..." try something like this. Let's see... it looks like you're surrounded by love. It seems as though we're looking at a very happy relationship here. Now, there's a woman in your life who is fruitful... is someone trying to get pregnant? I'm asking because the Empress here indicates fertility, and when she's paired up with that Queen..." and so on. Some people read Tarot cards "by the book," and others read more intuitively. If you're a "by the book" reader - which is not a bad thing, especially when you first get started - you'll want to have a basic knowledge of the cards and their meanings before you start. You can keep a book handy as you lay out the cards and go through them, or you can create a simple chart with basic meanings on it. Some people actually write the meanings on the cards themselves, so that the information is always at their fingertips. If you are one of those people who reads the cards intuitively, on the other hand, you'll pick up images and messages from the cards. Share these with the Querent as you see them. Be cautious about delivering messages of gloom and doom, because remember -- the cards present us with guidelines of what may happen given the present course. Anyone can change their own outcome by making new and different choices. When you've worked your way through the cards -- and it's okay not to address them in order, if several cards seem interconnected -- try to end the reading on a positive note. After you've finished, ask the Querent if their question has been addressed. If he or she says no, ask if perhaps the cards focused on a different issue that he was hesitant to ask about. For example, someone may be too shy to actually ask about their love relationship, so they'll ask something innocuous about their job or personal finances instead. It's not uncommon to find that the cards have answered questions that were unasked, but still relevant. Sometimes, unfortunately, the cards just don't seem to respond. If that happens, ask the Querent to re-shuffle, and try laying them out again. 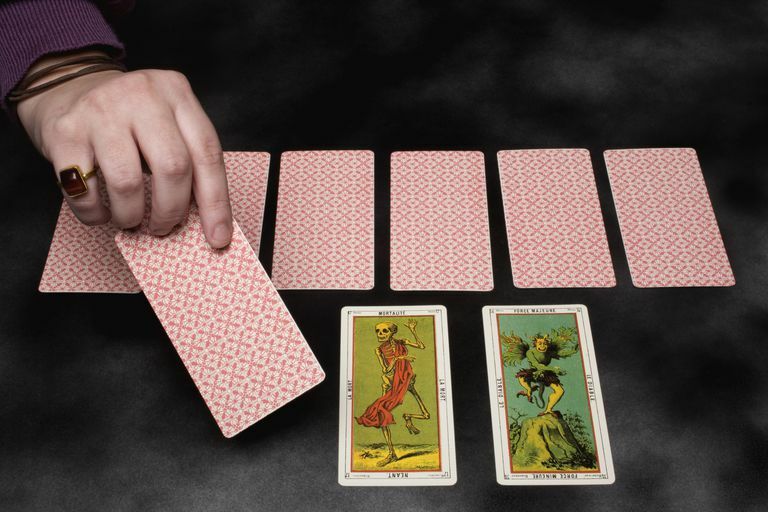 After a second time, if it doesn't look like they're cooperating, you should end the reading and put the cards away. You may wish to recharge them or ritually re-consecrate them before trying to read for the same person again. In general, it's not a bad idea to wait a few weeks - in many traditions, the length of a full lunar cycle - before reading for them a second time. Even if the cards do tell the Querent what he or she want to know about, you should generally wait around a month between readings - especially if they're paying you. Which brings us to the issue of charging for your services. If you're just starting out, and reading for friends and family, you may want to go ahead and do free readings - it's a good way to hone your skills, and if you do miss the mark, no one feels like they got ripped off. While some people do feel that no one should ever have to pay for a Tarot reading, the decision to charge or not is entirely up to you. If it's something you're going to do on a full time basis, good wishes and charity will not pay your bills. If you decide to eventually charge, the key is to determine what is a fair market value in your area. It's important to never EVER let the cost determine the quality of the reading you deliver. The bottom line: show your Querents that you care about them, and deliver readings that make their time and/or money worthwhile. Work at your own pace with this free six-step study guide, and you'll be on your way to becoming an accomplished reader.